Leave Your Mark With A Customizable BBQ Branding Iron | OhGizmo! If a perfectly grilled steak isn’t enough to impress your friends at your next barbecue, I’m sure that personally branding their piece of meat will do the trick. 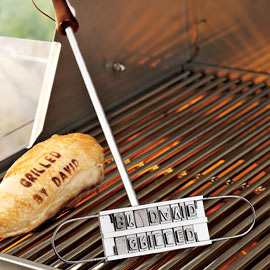 And to do that you’ll need this customizable BBQ Branding Iron. Instead of spending a small fortune to have the local blacksmith create a custom branding iron with just a single message, you can get this version which includes a set of 55 interchangeable aluminum letters (plus 8 blank spaces) for spelling out almost anything. (PWNED!) Creating a new message is as easy as sliding the individual letters into the two line track, but you’ll probably want to make sure the previous message has sufficiently cooled before swapping in a new one. You can get it from Solutions.com for just $14.95. Please use only to brand the friend’s steak and not the friend!